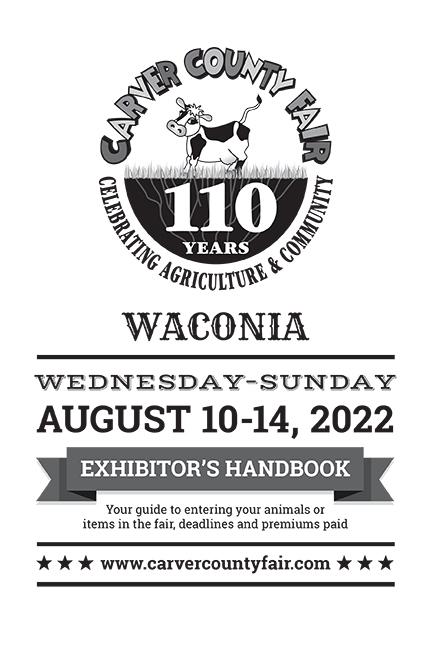 The Carver County Fair Exhibitor Handbook will help you with your exhibit selection. Please note: Upon publication of this year's Exhibitor's Handbook, all previous years' Exhibitor's Handbooks are null and void. Pre-registration is required for livestock entries. 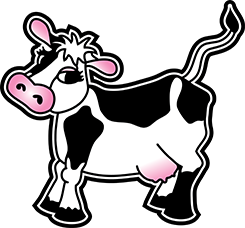 Livestock paperwork and entry fees are accepted via the online form. Registration has not opened yet. Check back soon. All exhibits require an entry tag. Pre-registration allows your tags to be prepared in advance and available for you at your time of entry. Agriculture and Education Buildings only. If you do not pre-register, you may register on-site during the drop-off times below. All exhibits require an entry tag. Please be prepared to wait while your entry is processed. Monday, August 5, 5 to 8:30 p.m.
Tuesday, August 6, 8 a.m. to 5 p.m.
Monday, August 5, 8 a.m. to 8 p.m.
Tuesday, August 6, 8 a.m. to noon. If your exhibit requires an entry fee, you can pay it by using the online registration form or by enclosing the fee with the printed entry form. Fair pass, one per exhibitor. Car pass, one per residence/family. Exceptions: 4-H livestock exhibitors will receive gate passes through the 4-H registration process and will not be issued an additional gate pass. All animals will be inspected by the official veterinarian Wednesday, opening day, and throughout fair week. The official veterinarian will order the immediate removal to a quarantine facility or removal from the exhibition premises of any animal showing clinical signs of any infectious, contagious or communicable disease, including ringworm and warts. Any animal showing evidence of any disease, abscesses, or any open contagious lesions will not be allowed to exhibit or show and will be subject to isolation or expulsion depending on the nature and seriousness of the disease, abscess or lesion in question. If illness of any nature is suspected in any animal, said animal is subject to examination by the official veterinarian and fair superintendent. The owner/exhibitor of said animal must abide by the decision of this veterinarian and the designated fair superintendent. Animals with warts or ringworm may not be shown. A statement from a veterinarian that an animal is being treated for these diseases is not acceptable. Animals known by the exhibitor to have an infectious, communicable disease or to have been exposed to an infectious, communicable disease, or to be from a quarantined flock may not be entered in an exhibition. Bring more exhibits and receive a special ribbon recognition. Again this year, a large colorful Special Ribbon will be awarded in different departments and divisions to individuals exhibiting the most exhibits (6 or more in any one division) in the given department. For example, the most poultry entries, the most canning entries, the most flower entries, etc. Find out how your entires did by visiting your exhibit at the fair. We also post the winner's list on the website the week after the fair. How do I claim my ribbon or prize? Prizes can be claimed on Monday, August 12. Feel free to contact the Superintendent for your department if you need more information. When can I pick up my exhibit? Sunday, August 11, 8 p.m. to 10:30 p.m.
Monday, August 12, 9 a.m. to 3 p.m.
Sunday, August 11, 8 p.m. to 10 p.m. The site contains detailed info regarding each department, downloadables (including premium books) and links to online registration (where applicable).